Shaun Robinson produces a spectacular finish against York City Knights. PIC: Simon Hall. 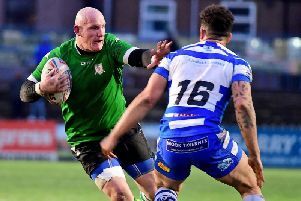 TWO Halifax players could reach career landmarks against Toronto Wolfpack this weekend. Halifax host the Betfred Championship leaders at the Shay this Sunday, looking to pick up their first-ever win against the Canadian outfit. QLT in action against Bradford Bulls during pre-season. PIC: Simon Hall. Shaun Robinson has started the Championship season in prolific form and is just three tries away from 100 for his career. The winger has scored for a host of clubs and has already bagged six tries for Richard Marshall’s side this term. The 29-year-old scored 17 tries for Featherstone Rovers last season after joining Fax’s West Yorkshire rivals ahead of the 2018 campaign. He claimed 44 tries for Swinton Lions between 2015 and 2017 and also scored three times for Dewsbury Rams, five times for Rochdale, as well as claiming 11 tries for Oxford and 11 for Oldham, where he started his professional career. Meanwhile, Quentin Laulu-Togaga’e needs just two tries for 200 for his career. The former Samoan international scored one international try, along with an incredible 164 for Sheffield Eagles during a six-year speall between 2011 and 2016. He scored 22 times for Toronto before moving to Castelford Tigers via Halifax, he then scored six times for the Super League club. The full-back has bagged five tries for Fax during two separate spells. Halifax have lost both of their home meetings against Toronto by a 14-point margin. They were defeated 20-6 in February last year before losing 14-0 in the Qualifiers at the beginning of August. Toronto were formed ahead of the 2017 season, entering Betfred League One where they earned automatic promotion to the Championship at the first time of asking. They reached the Million Pound Game in last year's Qualifiers but were beaten 4-2 by London Broncos in a tryless game at Lamport Stadium.